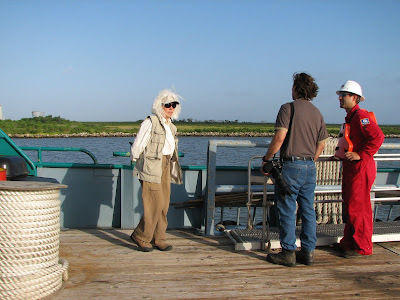 Click to enlarge and you will see the swing ropes we would have used to get from the boat to the platform. Unfortunately the seas were so high the captain would not let anyone, including the seasoned hands, attempt the transfer. We just got off a plane – something I’m always happy to say. I may be a frequent flyer but I’m also frequently a white-knuckle flyer. Bouncing around in turbulent skies scares the bejeezus out of me. But I’ve never come even close to getting air-sick. I can even brag about surviving with stomach intact many extreme helicopter rides. Most were piloted by ex-Vietnam service guys with eyes that have been bloodshot since the 60s. The take-off briefing usually includes the question, “Dudes, do you want a ride, or do you want a RIDE? It makes no difference what you answer, you are going to get the RIDE (heavy sigh). I’ve been scared, but never even queasy, much less nauseated. I hate nauseated. I could deal better with a broken arm or blood spurting out of my neck than pukey. 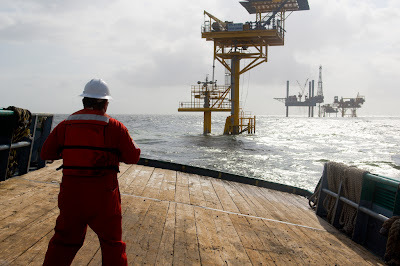 But like I said, I never get motion sickness so I didn’t worry one bit when we got the call to shoot an offshore platform from an ocean going crewboat. In fact I was looking forward to the experience of swinging from a rope, tarzan-style, to get from the boat to the platform. This was taken on the crew boat as we were going out, before we all got sick. 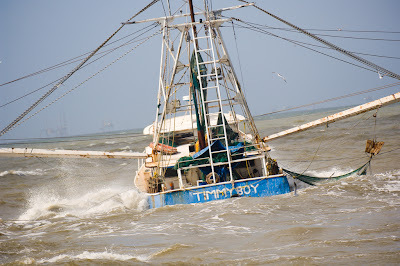 After watching this shrimp boat crash wildly through the waves, I had a new respect for fisherman along with my upset tummy. Me and The Guys - as usual I was the only female in a sea (hahaha) of testosterone. Iron stomach that I am, I laughed along with the rest of the crew when the captain started talking about getting hang-time once the boat cleared the seclusion of the jetties. Hang-time on a 100-foot vessel means seriously rockin’ and rollin’ high seas adventure. Or in my case, seriously struggling to hold on to the porcelain convenience. The boat was pitching so hard I literally could not stand up and walk without being violently thrown into the bulkhead. The sound the boat made as it lunged out of the water was creepy. And then waiting for the sickening crash back into the swells was, well-let’s just say it made it hard to aim. In my wacko female brain the fact that everyone tossed their cookies - male and yours truly alike - somehow makes me feel better. At least when my eyeballs quit jumping around in their sockets I’ll feel better.